"As President of the European Parliament and former Solidarnosc activist, I praise very mach this cultural initiative wich creates a virtual space with information on exemplary figures of moral resistance to totalitarianism in our European history". A European project featuring the construction of a website dedicated to the Righteous of Europe. The history of the 20th century in Europe abounds with exemplary figures of moral fortitude; men and women who stood up, in different ways, against Nazism and Communism, and in defence of truth, all with the common goal of safeguarding human dignity. This universal value is fundamental for the new Europe, whose identity is expressed in respect for freedom, democracy, tolerance and human rights. The aim of the Wefor project is to create a digital space in which the memory of such people will be kept alive and celebrated. The Wefor site will provide European citizens with biographical data, sources, interviews, media reports and other audio and video material, documentation and reflections on these exemplary figures and on the historic, political and cultural contexts in which they were prompted to act and react. Graphically and dynamically, this aim has been achieved by grouping Gardens of the Righteous together in one section; this includes real gardens – in Milan and Yerevan – and “imaginary” 3D gardens (or “virtual reality”) representing Europe’s cities. Each tree symbolizes a “Righteous person” and is surrounded by interactive tools that enable you to chat with other users in real time, send post-its, tributes, thoughts and reflections, multimedia elaborations, requests, links. You will be able to organize virtual meetings, ceremonies, remote debates and vide conferences. A section devoted to further insight: it contains material researched and developed by our editorial staff or gathered via Gariwo’s partners and other contacts, then arranged in the various pages of Wefor. It is sub-divided into key subjects concerning the Righteous and related political, cultural and historical contexts. A sector addressed to teachers and students: it contains material produced by schools and provides useful classroom material on the subject of the “Righteous” in the totalitarian regimes of the 20th century in Europe. Technologically advanced, the website offers excellent interactivity and is designed to involve both junior and senior high schools in heightening their students’ awareness and understanding of the movements, upheavals and aspirations that marked Europe’s recent history and that have defined our identity today. It includes teaching kits that suggest how to proceed, examples of projects already accomplished and guidelines for pathways to be followed with specific contents indicated. The section features a space for recording the results of the educational work done, the students’ output, the teachers’ blogs, reports and notes and any other correlated material. - announce artistic, literary, multimedia and documentary productions (FACES AND VOICES, with books, films, interviews, documentaries, exhibitions, etc.). Multimedia productions set up to present characters, stories, places, events which marked the history of Europe and its neighbouring regions. Interviews, movies, documentaries, exhibitions, trailers. Private and public research institutes, cultural associations, museums, memorials devoted to Memory and the history of single regions or the whole Europe, divided by nation. Original documents reproduced for reference. Autograph sources, diaries, dedications, pictures, title pages, period articles, messages, phonograms, governmental, military and administrative clearances and orders, other archival exhibits. Wefor is our Website dedicated to the figures of moral resistance against totalitarianism. The virtual Gardens of Europe’s Righteous and the teaching section YouFor are the core of this project realized by Gariwo, the forest of the Righteous. 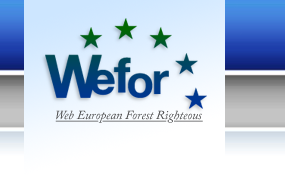 Through the establishment of the European Day of the Righteous by the Brussels Parliament, Wefor has received its highest recognition.